Being able to know your way around a social network of 2B MAUs is pretty useful. It's an ocean of opportunity. And if you have the right tools for this ocean, such as, the right goggles, flippers and scuba gear, you'll not only be able to find the small fish (ðŸŽ£ ), but also the medium to large ones (ðŸ�Ÿ ). Oh heck, you may even find a whale or two (ðŸ�‹ x2). Sounds good right? How I learnt the framework and strategy was predominantly through jumping in the deep end (ok just one more ðŸŒŠ reference) and trying to make sense of things as I went. That way does work. But as Brian Balfour put it (and I mentioned in an earlier essay) to learn the most you must put one foot in the known and one in the unknown. If you're like me - who just went full unknown - it's hard to unpack the best practices and structure, resulting in a much slower learning rate. And that is blasphemy in user acquisition. So hopefully, this essay will allow you to have that little bit of known to make your learning super fast. Facebook is pretty far reaching and can even help aid you with your conversion funnel and pirate metrics. Well some of them at least. Facebook's targeting capabilities are second to none. They have made it so easy to target their 2B MAU user-base to seriously granular levels. For example, you can target women, aged 35-38, newly engaged, with an income of X+, who own an iPhone on iOS 10 in Okehampton in Devon, England. Granted that target audience will be pretty small and won't be that effective, you get the gist. But this essay isn't about these targeting capabilities, rather to give you a framework to help with your overall paid campaigns no matter which stage of the conversion funnel you focus on and however you decide to target. This framework is built for testing. Testing gives us more value. More value means more of your OMTM. Now let's maximise your ROAS. Simply put, when building an ad campaign you have a campaign, an adset and an ad. Each stage represents something different. The best structure I have found is for each campaign to have four adsets with four ads a piece, meaning, 16 ads running simultaneously. Of course, you can change this depending on what you want to test. If you have a top performing adset, then you only need the one adset and test 16 different ads simultaneously to find what drives your OMTM most. Similarly, if you have already found a best performing ad, you can replicate that one ad across 16 different adsets (if you have that many user profiles you want to test). You can freestyle. Depending on what you are testing - be it different adsets or ads - you'll be structuring your campaign similar to the previous images. At this stage you will have already an idea as to whether you'd like to run A/B or multivariate tests. The above can be done with varying degrees of difficulty, for example, you can have 4 copy variations and 4 creative variations meaning you'd have 16 testing variations for that one adset. Once your campaign is structured, your tests are outlined, and you've run it for the first two weeks, you can now make data driven decisions. 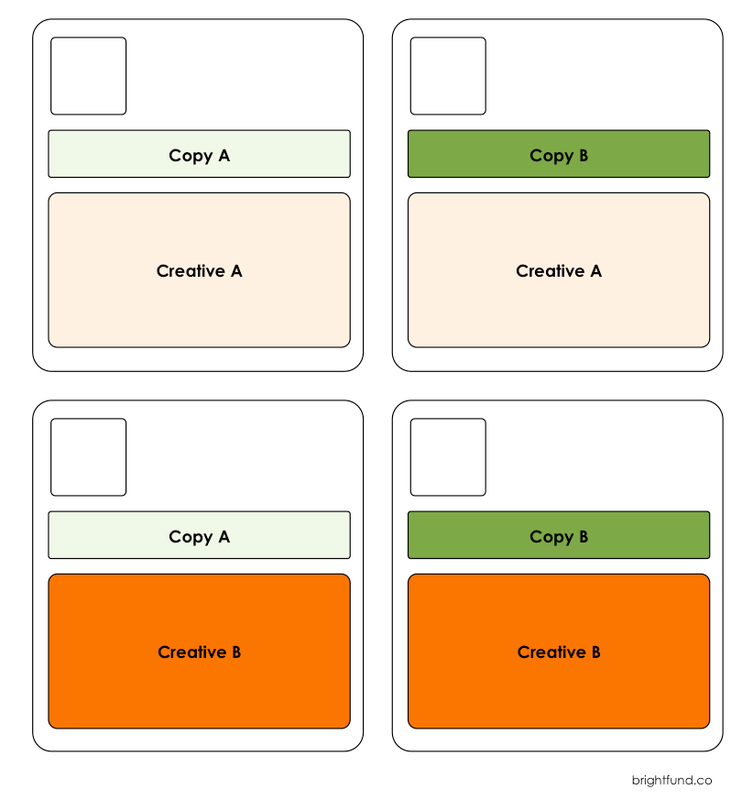 Below is your campaign running an A/B test with 4 creative variations. Next step is to iterate three more images based on the winner from each adset to use for the next two weeks. Meaning adset 1 would will then have creatives C, C.2, C.3 and C.4 as the new batch. Similarly, adset 2 will have creatives D, D.2, D.3 and D.4. And so on for each adset. This process allows you to iterate on the best performing ads to really drive your OMTM, no matter what stage of funnel you are trying to influence. Continue this iteration process until you find your best performing ads. After doing this particular test for a few months, you will get an awesome picture about which type of ad creative drives your OMTM the most. This process can be replicated for testing different copy, different creative, different adsets simultaneously or individually. Best thing to do now is just go out, set the structure, set the tests and press go. If you liked this, you can find more and subscribe on the homepage of Bright Fund. Feel free to check more essays on growth, strategy and user acquisition.